Posted June 25th, 2015 by Mobile Music School & filed under Announcements, Industry News. It is with great sadness that we report the death of prolific film composer James Horner, who died tragically in a plane crash, aged 61. Composer for the two highest-grossing films of all time, Avatar and Titanic, Horner was a true talent with an ability to captivate audiences at every turn of a film. Horner studied the piano from the age of five and attended the Royal College of Music in London where he continued his musical training. After moving to California, he earned a bachelor’s degree in music at USC and a master’s degree at UCLA before completing his Ph.D. in Music Composition and Theory. However, despite his extensive music education, Horner didn’t consider himself to be a particularly good pianist. Soon after he began scoring student films for the American Film Institute, Horner got his first big break with the score for Star Trek II: The Wrath of Khan. His success continued to grow as he went on to work with some of the biggest directors in the industry such as James Cameron, George Lucas, Steven Spielberg, Ron Howard and Oliver Stone, to name but a few. Among his 158 composer credits for films, TV and documentaries, Horner’s scores and songs for the films A Beautiful Mind, Aliens, An American Tail, Apollo 13, Avatar, Braveheart, Field of Dreams, and House of Sand and Fog racked up a total of eight Oscar nominations. 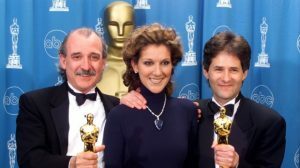 It was at the 1997 Academy Awards where the musician won big, winning an Oscar for both the Titanic film score and its theme song, “My Heart Will Go On” sung by Celine Dion, which he shared with lyricist Will Jennings. His score for the film is reported to be the highest selling orchestral soundtrack in history. Titanic director James Cameron claims Horner “reinvented the romantic score” by replacing violinists with haunting vocals and Celt inflections- typical stylistic features of Horner’s signature sound. With his ability to capture the true essence of a film and translate it through the means of music, it’s no wonder Horner won the Max Steiner Film Music Achievement Award at the 2013 Hollywood in Vienna gala for his exceptional achievements in the art of film music. We pay tribute to Horner’s outstanding achievements with this clip of his best soundtracks, and we look forward to the release of his newest work in upcoming films Southpaw, The 33, and Wolf Totem.